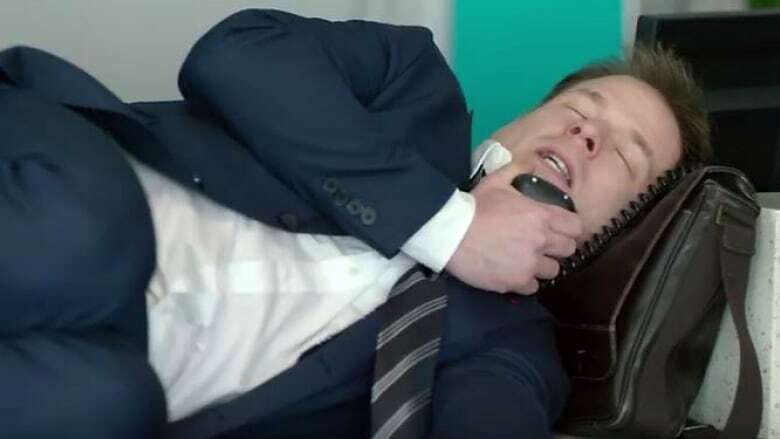 WestJet's latest ad campaign boasts that it doesn't overbook flights and bump passengers — at the same time, taking aim at airlines that do. The blitz follows a wave of media reports about angry passengers speaking out about being bumped. 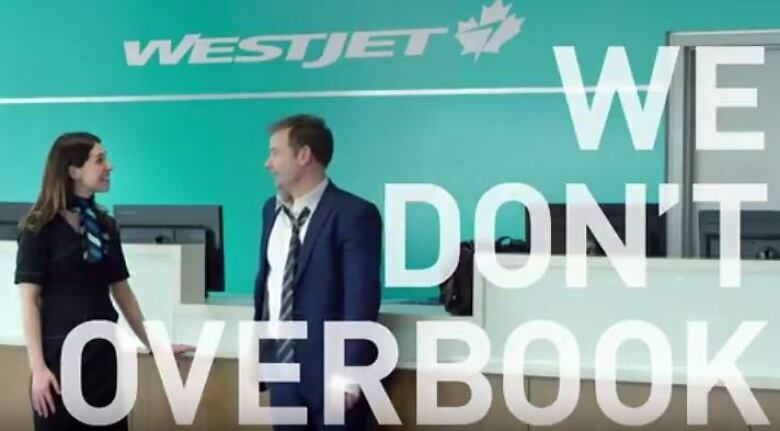 WestJet's new ad campaign boasts that it doesn't overbook flights and bump passengers. It also takes aim at airlines that do. The airline has always had a no overbooking policy but chose to do the campaign now, on the heels of numerous media reports about angry Air Canada customers being turned away from oversold flights. WestJet's blitz includes a slick TV commercial where a disgruntled passenger waits endlessly in the airport while griping about being bumped. In one scene, he's slumped on the floor. In another, he's sleeping on his briefcase. "How is it they sold my seat twice and now I can't get to my meeting?" says the weary man. The commercial ends with a WestJet employee saving the day; she informs the stranded passenger that WestJet doesn't overbook its planes, and offers to help him get a flight. The ad is running on TV, online and on social media until June 25. "This campaign allows us to boldly, clearly and publicly state that we do not overbook our flights because we care about the guest experience," said WestJet spokesperson Lauren Stewart in an email to CBC News. Airline bumping has become a hot topic, thanks to recent cases that garnered much media attention. The issue was thrust into the international spotlight in April when passenger David Dao was forcibly removed from an overbooked United Airlines flight in Chicago. Around the same time, CBC News began a series of stories detailing sagas of customers bumped from oversold Air Canada flights. They included a family who was ordered off a plane after taking their seats, a woman who missed her $10,000 dream cruise, and a 10-year-old who was bumped from a flight he was supposed to take with his family. 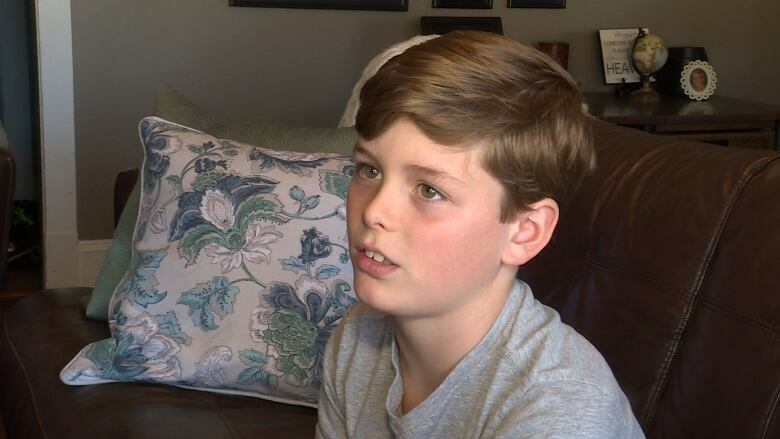 "They shouldn't be able to sell the same product twice," the boy's father, Brett Doyle, from Stratford, P.E.I. said at the time. His comment sounds similar to the passenger in WestJet's commercial who asks, "How is it they sold my seat twice?" "WestJet's smart. I think they're capitalizing on the focus and attention out there [on overbooking]," said Toronto aviation consultant Robert Kokonis, with AirTrav Inc. He believes the recent stories inspired the airline to launch the campaign. "WestJet is just getting ahead of this and saying, "Hey, guess what? We don't bump.'" But the airline denies that recent reports had anything to do with the ad. Stewart acknowledges that "overbooking has been a hot-button topic recently," but said the campaign had been in the works for a number of months. "The timing here is purely coincidental," she said. WestJet's campaign includes a Twitter hashtag: #OwnersCare and a blog that outlines why airlines overbook flights — and WestJet doesn't. It says that overbooking happens when an airline sells more tickets than seats, banking on some passengers not showing up. "It's not always pretty but airlines do it because it fills planes and maximizes revenue," states WestJet. The airline adds it may wind up bumping passengers due to mechanical problems or because it has to switch an aircraft for a smaller one, but that it doesn't set out to overbook flights for profit. "We do believe you should get the seat you paid for." CBC News asked Air Canada what it thought of the WestJet campaign. "We do not comment on how other companies spend their advertising dollars," spokesperson Peter Fitzpatrick said in an email to CBC News. Overbooking flights is a widespread industry practice. Many industry analysts claim the rate at which it actually results in the involuntarily bumping of passengers is rare. Some analysts also say the practice can help airlines keep costs down and provide opportunities for those needing last-minute flights. If the federal government gets its way, WestJet's message that it doesn't overbook could soon fail to be a selling point. Transport Minister Marc Garneau has pledged to ban involuntary bumping due to oversold flights through a passenger bill of rights, set to take effect in 2018. "When Canadians buy an airline ticket, they expect the airline to keep its part of the deal," said Garneau last month. While WestJet hasn't been the target of overbooking complaints, the airline has faced its own spate of bad publicity recently. Last year, the airline dealt with a wave of complaints about delays, schedule changes and cancellations involving its new service to London, England. To avoid similar criticisms this year, WestJet has reduced the number of flights it's offering to Gatwick airport. Should airlines be allowed to overbook flights and bump passengers?